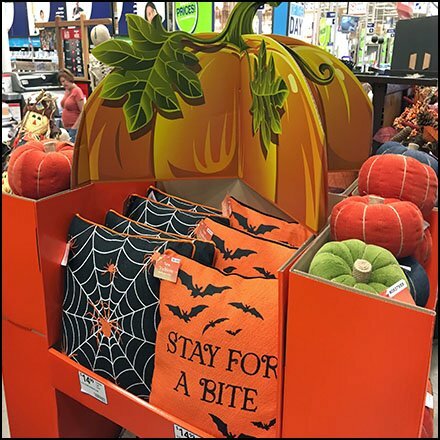 An easy way to merchandise as well as easy way to decorate for the holiday is provided by this Halloween Throw Pillow Pallet Display. The flat pillows add to comfort too, but choose a pumpkin shape if fun is more the intent. A pumpkin header rises above to insure a Fall-like appearance overall. This Halloween Throw Pillow Pallet Display seen at Lowes.